This hotel as the most friendliest team of staff I’ve seen under on roof for s long time nothing is too much trouble for the so helpful in every way. The rooms are spotlessly clean and tidy with good state of decor. 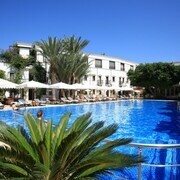 The court yard area and pool are at the centre of the hotel making the veiw from your balcony / terrace very nice. Breakfast. Well what can I say. One of the nicest I’ve had. Great choice served in a lovely dining room with lovely smiling staff to welcome you. Thanks for a great stay. The property was a wee bit remote possibly due to nothing being open second week in April. The staff were excellent and always smiling and very courteous. Food was really good for all inclusive Drinks were ok however no imported stuff only local , which was ok but very weak. 7 euros was asked for if you wanted proper drinks which is a bit steep. Maybe the hotel could offer an upgrade package for drinks. Entertainment was your usual stuff. Not the best. Defo a lovely hotel if a tad quiet but the staff are amazing. Where to find Bodrum hotels near an airport? How can I find hotels in different Bodrum neighborhoods? Where can I find hotels in Bodrum that are near tourist attractions? You’ll experience everything but boredom in the Turkish city of Bodrum. Culture, nightlife, and the beauty of the Aegean Sea make this port city a popular global holiday destination. It famously housed one of the Seven Wonders of the Ancient World. In fact, you can visit the ruins of the famous Mausoleum of Mausolus to this day. The beautiful streets you’ll walk on have fallen under rule of Greeks, Persians, and Crusaders throughout history. Historic castles still line the city’s majestic harbours. You can even walk in the footprints of Herodotus while you’re here. When you’re ready to explore a contemporary resort city with an ancient past, trust Expedia for deals at hotels in Bodrum, Turkey. You’ll discover that centuries of art, war, philosophy, and passion can be experienced on your budget. You can expect to interact with people from all over the world when you spend your holiday in one of Turkey’s most popular destinations. The city is known to attract sophisticated and worldly visitors to its ancient streets. In fact, it’s every bit as common to meet an international mogul as it is to see an esteemed archeologist poking around. Despite the city’s long history, it offers all the charms and excitement of any other truly modern city. You can indulge in fine dining, upscale shopping, and a little bit of partying while you’re here. Bodrum’s Mediterranean climate is one of the main reasons why the dazzling city has become such a popular four-season destination. Summertime temperatures usually linger near 34 degrees Celsius. Winters here offer pleasant temperatures close to 15 degrees Celsius. You can expect abundant sunshine and mild humidity throughout the year. You’ll feel like a character in an intriguing novel as you lounge by the pool at your Bodrum hotel wearing a pair of black shades. Get ready to stand in awe of the Castle of Saint Peter, Myndos Gate, and Pedasa Antique City. There is much to learn at the Bodrum Museum of Underwater Archaeology, the Zeki Muren Arts Museum, and the Institute of Nautical Archaeology. Enjoy views of boats and yachts when you grab dinner at a great restaurant near Port Bodrum. Want to add relaxation to your itinerary? Don’t miss Bitez Beach. If you’re looking for something to keep you busy after the sun goes down, Bodrum Barlar Sokagi is home to the city’s best bars and nightclubs. Renting a car in Bodrum is the smartest way to ensure that you’ll be able to explore a mix of archeological sites and city attractions. Let’s talk turkey about how to get the guaranteed best rates on your Turkish holiday. You can avoid searching all over the Internet for deals by entering your travel dates into our exclusive online travel tools. 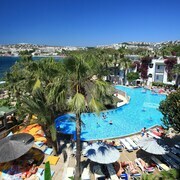 You can even browse for cheap flights to Bodrum to accompany your cheap hotel stay. 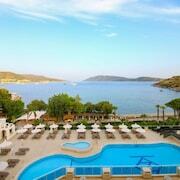 Get to the other side of the globe for less using fabulous discounts at Bodrum hotels from Expedia. 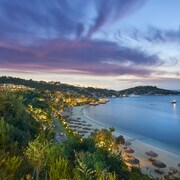 What are the most popular Bodrum hotels? Are there hotels in other cities near Bodrum? 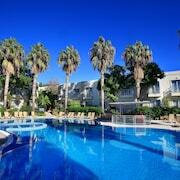 What other types of accommodations are available in Bodrum? Explore Bodrum with Expedia.ca’s Travel Guides to find the best flights, cars, holiday packages and more!